I bought several sets of down pillows. These are very comfortable, and very reasonably price. I would buy again. The beautiful lattice quilting is designed to avoid shifting and the double layer fabric provides an extra barrier against the natural fill. A 2 inch gusset allows for a higher loft to provide a comfortable place to rest your head. Filled with 95% goose feather and 5% goose down for that sturdy pillow you crave. 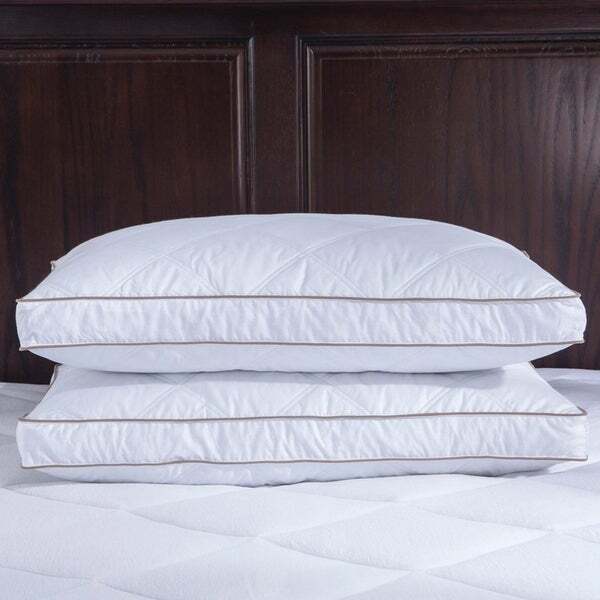 Pillows are made from Quilted 233 Thread count 100% coton with inner polyester liner. Filled with 34 ounces of 95% gray goose feathers and 5% gray goose down. Spot Clean, Dry Clean Reccomended. Materials are Responsible Down Standard certified and cleansed by Oxipower technology. These pillows will take a few minutes to fill out to full form once unpacking from shipping, but they are GREAT! I've been looking for down pillows like these that have the amount of softness and form, and I took a chance on purchasing them- because I usually go to a store to feel and try pillows before purchasing. Not only do they look nice, but they feel extremely nice. In the past, I've always looked for the best value versus quality (because some pillows get extremely high in price range), and I was not disappointed at all with the value of these pillows and the quality. I think for anyone that is trying to find great down pillows for their bedroom- I'd 100% recommend these if you're trying to not only get cost value, but quality value as well. My husband and I love these pillows. They are moldable but still provide support. We like the cold feeling of the goose feathers. It isn't the type of down pillow that is ultra soft, the support is still there. They're a bit loud/ crunchy sounding but I'm hoping it will go away. Otherwise comfy so far. Nice and manageable but not too filled. It's definitely looser filling. Yes yes yes! I love these. Perfectly fluffy, and yet firm. I slept so good last night with these two new pillows. And I can't wait to go to bed again lol I recommend to all my fellow feather lovers!! I bought these for my daddy, who recently moved to an assisted living home. He just loves these pillows. He won't wouldn't let my mom use them, so I had to order another set for her! love love these pillows, extremely comfortable. These are ok. I much preferred the Canadian Down and Feather company down perfect pillow and so I sent these back. They probably would have been fine for the kids but felt a bit flat for me. Got these for my grandson and his wife for Christmas and they love them. Was telling his cousin about them and him and his wife bought a set I’m next to get mine. The quality is good but they are hard--they have to be "broken in".